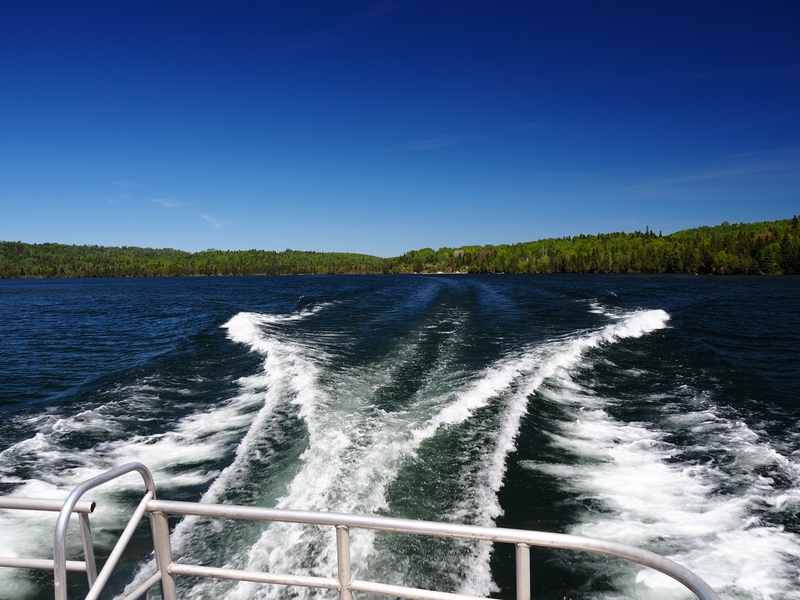 Since we’d all journeyed way up to the North Shore, almost everyone agreed that we needed to behoove ourselves of this oppotunity for a daytrip to Isle Royale National Park. The park is only accessible by boat and we lucked-out in that the transportation boat, the Seahunter III, was starting its season the week we would be visiting. 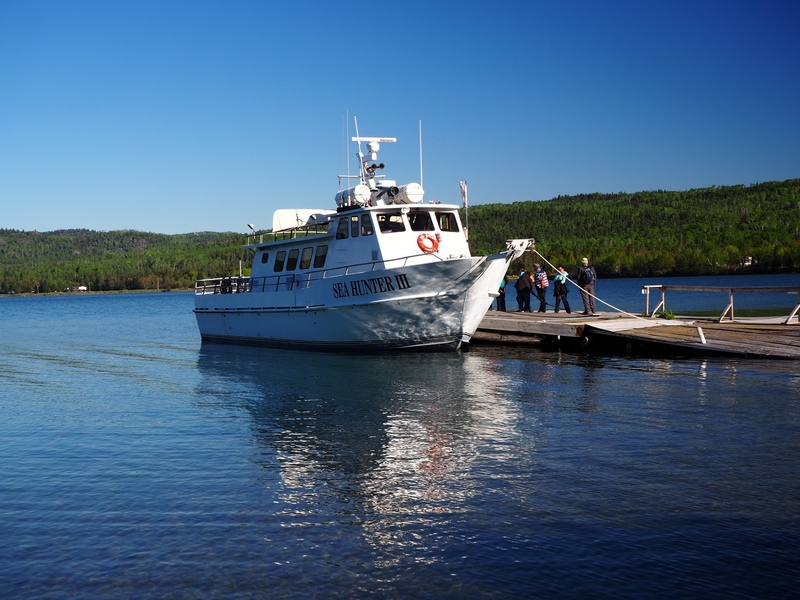 The Seahunter III is a 65-foot twin diesel vessel that provides passenger service between Grand Portage, Minnesota and Windigo, Michigan, the park headquarters on the southwest end of the island. 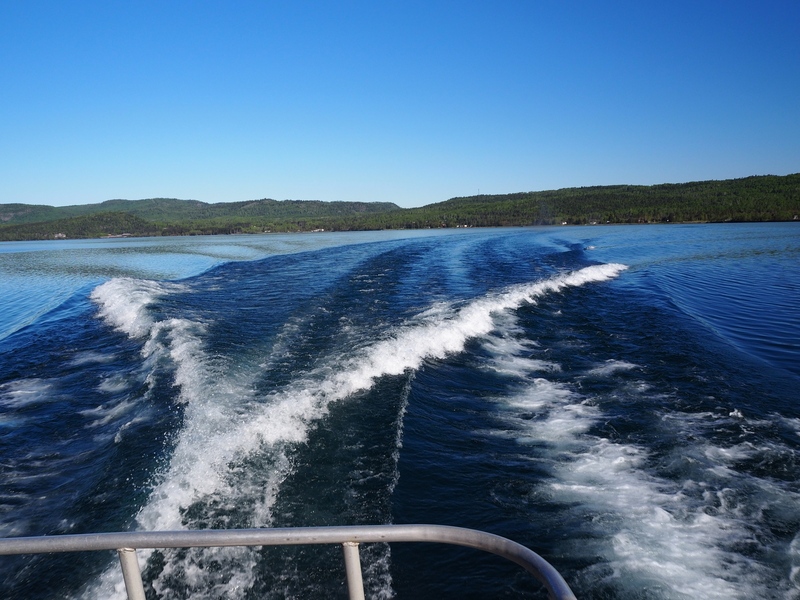 There was some trepidation about riding a small boat across a large lake but conditions on our day of travel were sunny, clear, and glass smooth. 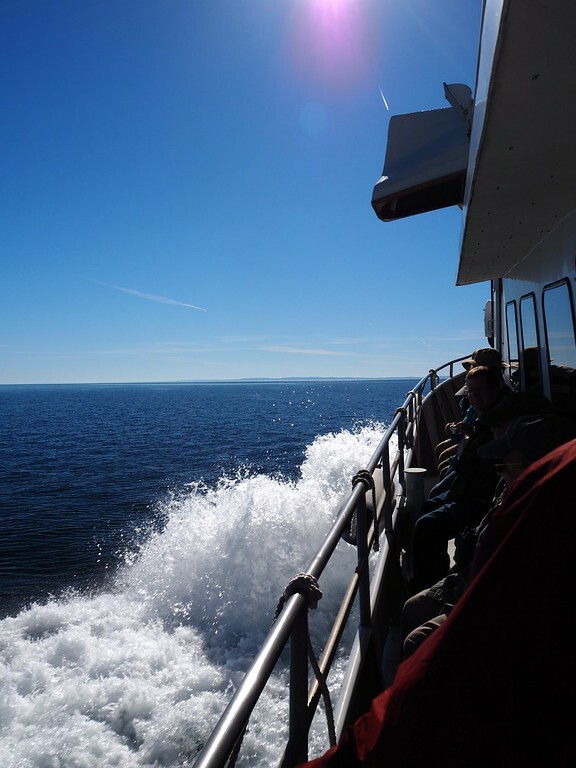 These calm conditions were good because the boat had a full passenger load of daytrippers and backpackers and none of us wanted to discover what someone else had had for breakfast. 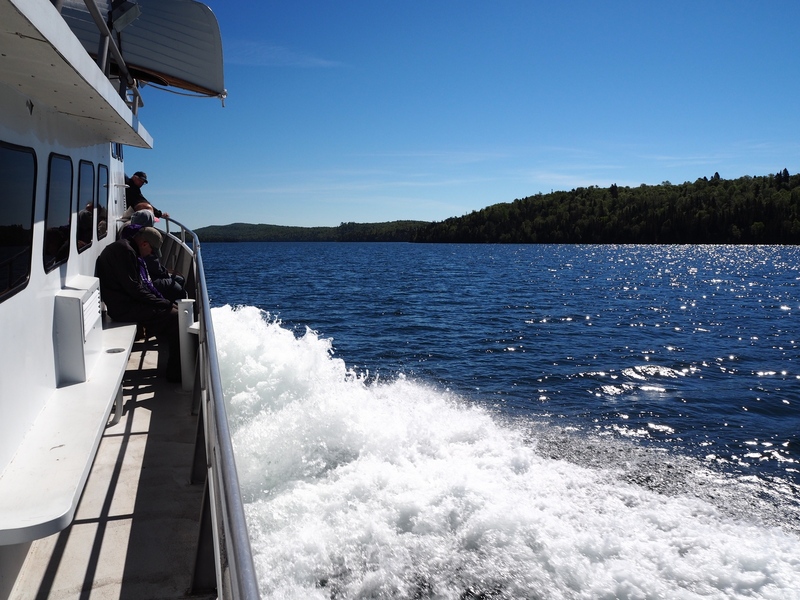 Passenger loading was well organized and we were soon, thanks to those powerful twin diesels (and the calm conditions), zooming out of Grand Portage aiming for Isle Royale. After bit of really open water, we could start to make out the island as a dark line on the horizon. Meanwhile, down in the passenger cabin, the LovedOne was either: (a) trying to suppress a mutiny being fomented by her sister or (b) just strangling her sister for the heck of it or (c) giving her a firm, but sisterly, hug or (d) whatever. Fortunately we were able to calm things down before the captain had to issue muskets to the remaining loyal crew members and just in time to transit North Gap and visit the wreck of the S.S. America, a 185-foot long passenger and package delivery ship that sank (without loss of life) off the shore of Isle Royale in 1928. Its remains are still on the lake bottom. past Beaver Island, and up to the National Park Servive dock at Windigo, where we were met by rangers who gave us a brief orientation talk about Leave No Trace and about not to getting stomped-on by a moose, this being moose calving season. 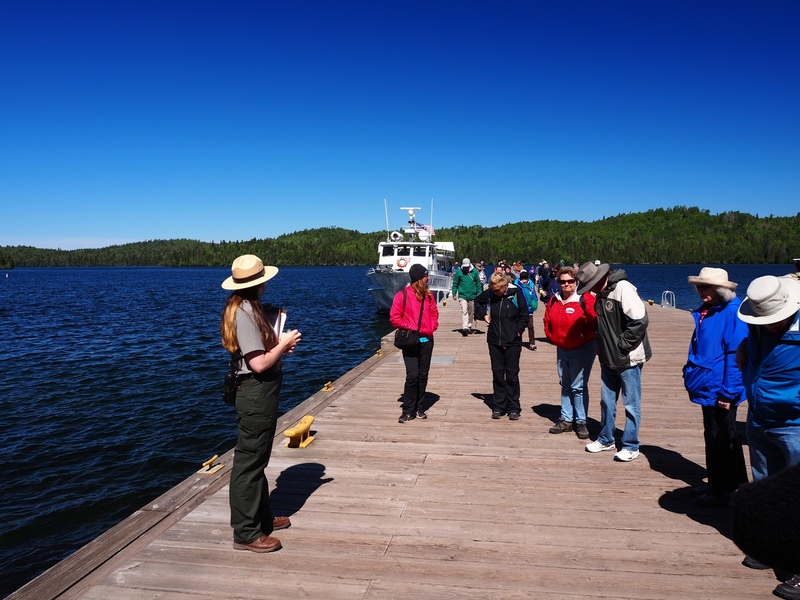 Isle Royale deserves more than a daytrip. There are rentable cabins in several locations (you have to bring all your own gear and food) as well as miles of trails and numerous backpacker campsites. 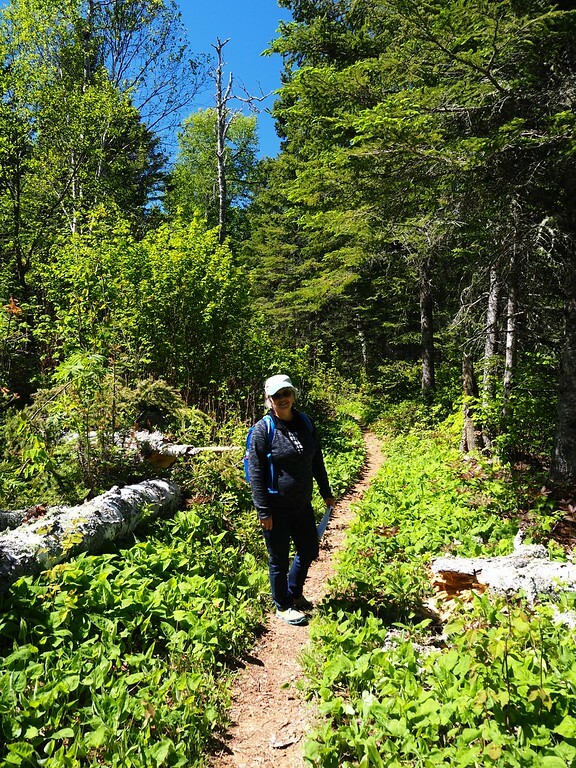 But to make the most of our 4 hour daytrip, we decided to hike the one mile Windigo Nature Trail, which begins and ends at the visitor center. If we were lucky enough to see a moose – hopefully an unprovoked and non-charging one – so much the better. Sadly (or maybe not) no moose were sighted during our brief hike. 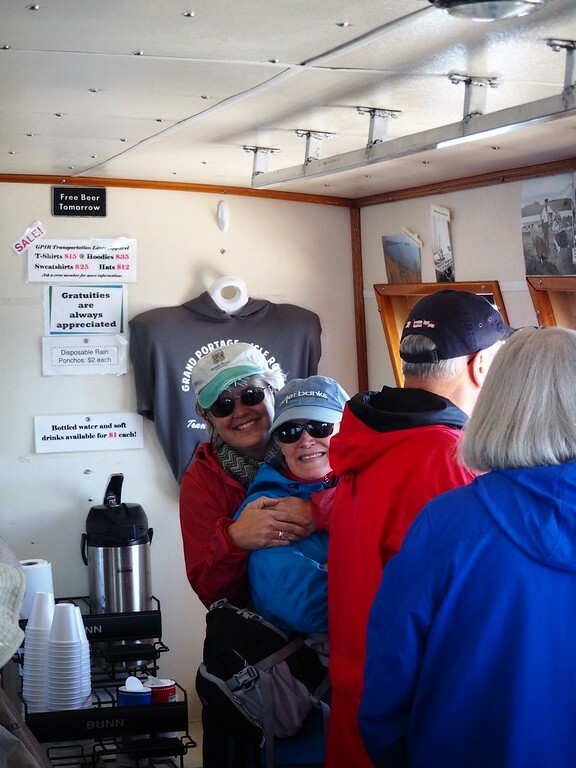 After the nature trail, we wandered over to the campground with the rentable cabins (still no moose), watched the Park Service haul garbage off the island, hit the gift shop for a few moose-themed trinkets, and then got back on the boat. The rangers were there to wave us good-bye. No matter how corny this may look, I thought it was a nice, old-fashioned gesture. I can get cynical about a lot of things – and there are many of those these days – but the U.S. National Park Service is not, and never will be, one of them. 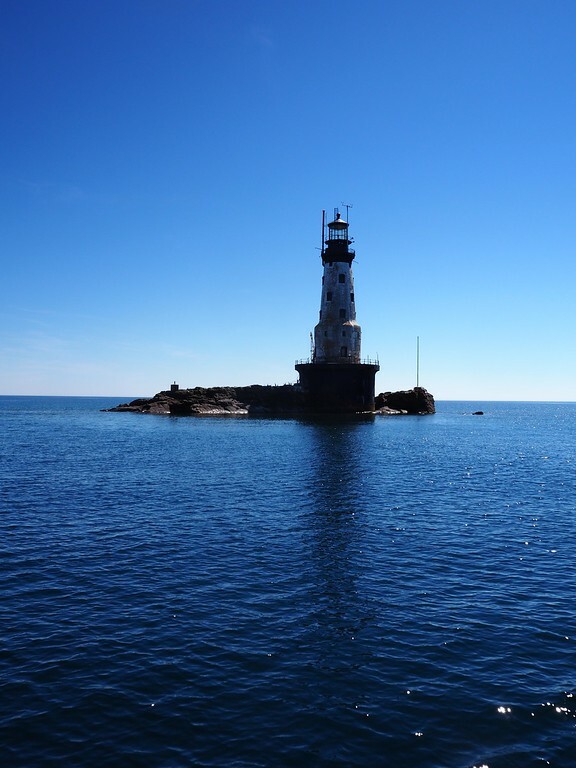 one that took us past the Rock of Ages lighthouse off the southwest end of the island. 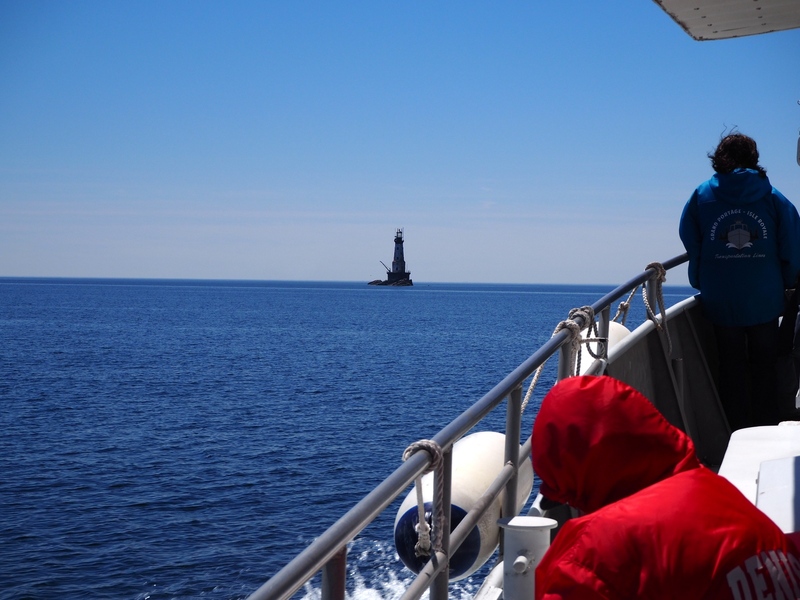 From the deck of a 65-foot boat, I thought a lighthouse was a more reassuring tourist attraction than a 183-foot sunken steamer but perhaps I’m too sensitive? 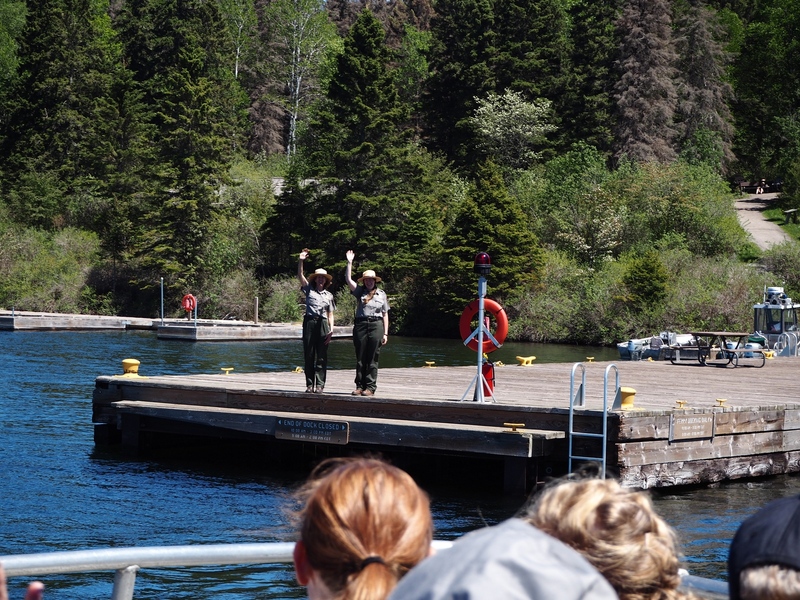 The Seahunter III returned us to Grand Portage in mid-afternoon, which left time for a short visit to Grand Portage National Monument, one based on cooperation between the Grand Portage Band of Lake Superior Chippewa and the National Park Service. We found this particular Monument to be a very informative arrangement of museum exhibits, reconstructed buildings, and live actors. 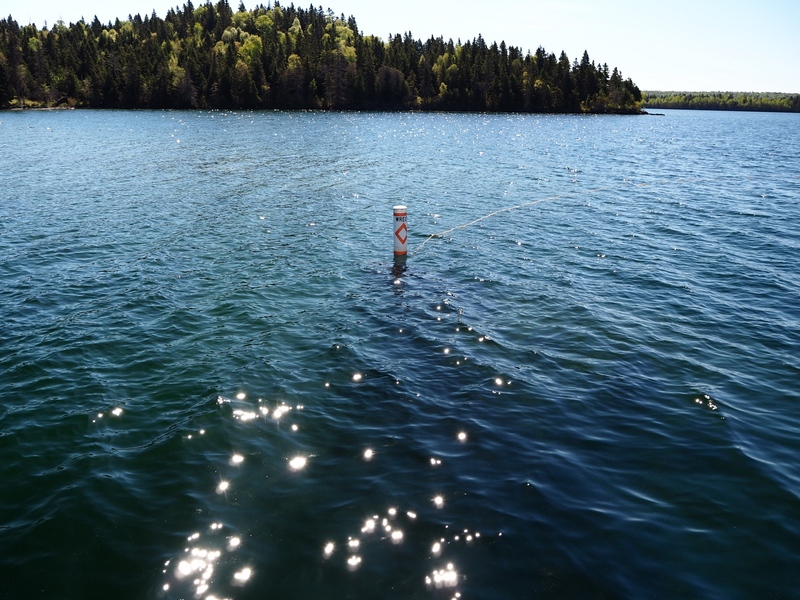 The Grand Portage involved voyageurs carrying 180-pound packs (!) 8.5 miles between Lake Superior and Fort Charlotte on the Pigeon River (today’s border with Canada). 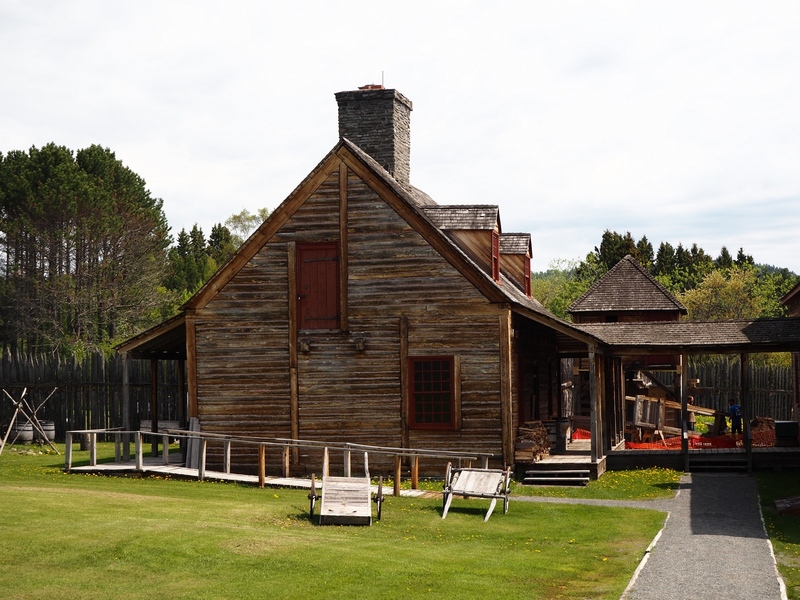 After wandering around the museum (and the gift shop), we went down to see the reconstructed portions of the North West Company’s inland fur trading headquarters. 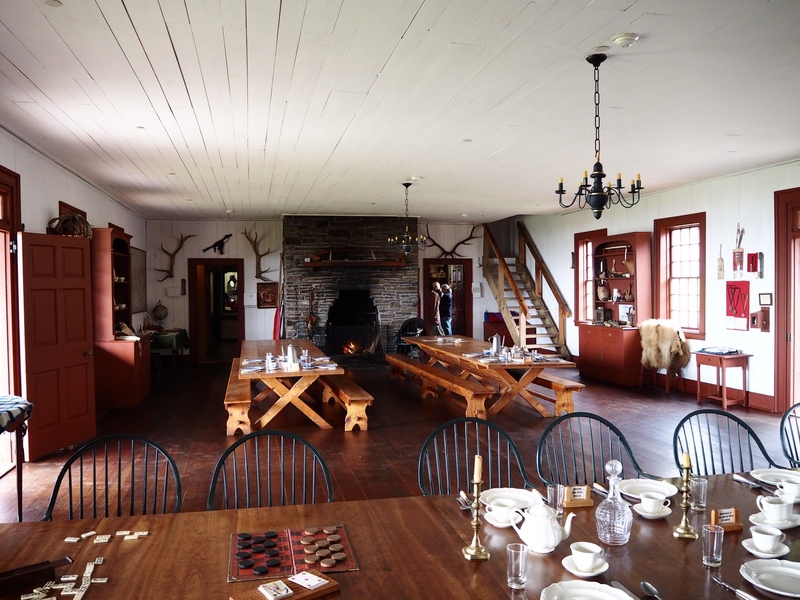 It should be noted that the kitchen and Great Hall were only for feeding partners and clerks; the voyageurs had to cook their own meals elsewhere. 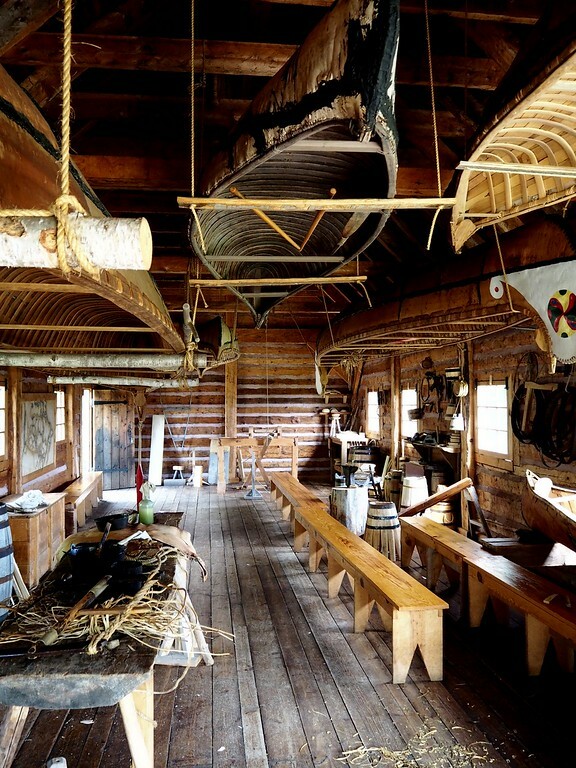 The warehouse is now where they fabricate faithful reproductions of the various canoes the voyageurs used to transport trade goods in to, and furs out of, this region. There are people in all these places to answer questions and explain how things were back in the day. Coming from what is today’s Northwest, it was enlightening to see how things were and worked here in the Northwest of yesteryear. Since the U.S. and Canada share a history in this region, we were able acquire some Canadian published books about the fur trade that we hadn’t previously seen in the States. 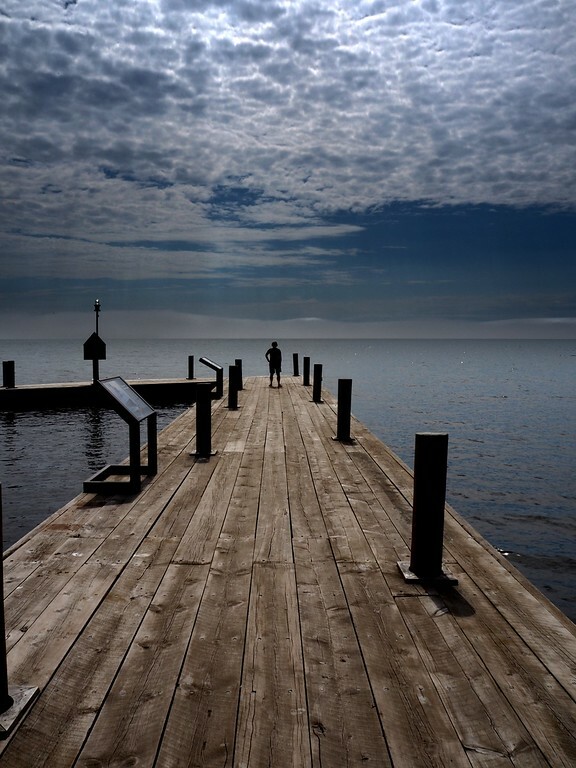 We started our drive back to dinner in Lutsen knowing that this had been a long, but highly rewarding (and fun), day.